Citation: Dirk W (2016) The Ongoing Effort to Reduce Abortions Worldwide: The Role Novel Frameless Iud’s Have and Their Ability to Provide High Tolerability and Continuation Rates. J Contracept Stud 1: 20. Copyright: © 2016 Dirk W. This is an open-access article distributed under the terms of the Creative Commons Attribution License, which permits unrestricted use, distribution, and reproduction in any medium, provided the original author and source are credited. According to a recent study conducted by the Guttmacher Institute, the global estimated annual incidence of induced abortion during 2010-2014 is estimated at 56 million . This number represents an increase of 6 million in comparison with the annual estimated incidence during the period 1990-1994. A slight decline in annual rates is reported in developed countries, but the rates have increased or remain stable in developing countries (Table 1). More induced abortions occur in married women in the developed world but more are seen in unmarried women is the United States (USA). Worldwide many women still have to undergo unsafe abortions for various cultural, religious or economic reasons; however, the true proportion is unknown. Estimates of up to 20% may occur in regions where abortion is restricted. Approximately 225 million women in developing countries have an unmet need for modern contraceptive methods. The lack of access to convenient contraception forces many women to resort to induced abortion, irrespective if they are safe or not (Table 1). Table 1: Global and regional estimates of induced abortion, 1990-1994 and 2010-2014. Even if women use effective modern contraceptive methods, real world utilization results in many failures due to incorrect or inconsistent use . Long-acting reversible contraceptives (LARC) methods are currently advocated by many governmental and AID agencies in an attempt to reduce unintended pregnancies in young women, to eliminate issues of ready access, and the need for patient intervention as well as personal privacy. Adolescents, for a variety of reasons, are more likely than adult women to discontinue a range of contraceptive methods, including pills and injectable contraceptives. Unintended pregnancy still persists as a major public health problem in developed countries including the USA. Although lowering unintended pregnancy rates clearly requires multiple approaches, individual obstetrician– gynecologists may contribute by increasing access to and advocating the use of contraceptive implants and intrauterine devices. The American College of Obstetrician–Gynecologists encourages the use of LARC methods (e.g., implants and intrauterine devices) for all appropriate candidates, including nulliparous women and adolescents and also advocate for coverage and appropriate payment and reimbursement for every contraceptive method by all payers in all clinically appropriate circumstances . Intrauterine devices are highly effective and widely used by women throughout the world. Studies have shown their effectiveness is equal to, if not greater than surgical sterilization with the advantage that they all are reversible. When compared to implants their ability to work locally with minimal systemic side-effects can be advantageous to many women. In recent years, many attempts have been made to prevent induced and repeat abortion by providing greater access to LARC methods. The incidence of repeat abortion varies form 30% in Finland to 47% in the USA . Immediate intrauterine device (IUD) insertion after induced abortion is very convenient and timely as it is an opportune moment to carry out this very short, easy and safe, procedure. Insertion post abortion allows for long-term contraception with little risk or inconvenience to the patient. Many women will fail to return if the insertion is delayed to a follow-up visit. Following insertion, the woman is protected immediately, before ovulation returns, usually within 7-10 days after first trimester abortion . Studies have shown that immediate, same-day post-aspiration abortion IUD insertion has been associated with a decreased rates of repeat abortion [5-7]. Insertion of an IUD following medical abortion is possible. A comparison conducted between insertion after one week and one month following abortion did not find any significant differences. However, immediate insertion increased uptake and utilization of the IUD . Despite the demonstrated safety of IUD insertion postabortion, the method is still underused. This may be due to provider concerns and fear of insertion caused by lack of training and insertion related information. The added cost may also be a deterrent to many women. The challenge remains to provide optimal and long-acting contraception immediately following induced surgical and medical pregnancy termination. This paper examines the place of the frameless IUD when inserted within minutes after surgical abortion. The frameless GyneFix® IUD (Contrel Europe, Ghent, Belgium) is an innovative concept which consists of either 4, 5 or 6 copper tubes, each 5 mm long and 2.2 mm in diameter, threaded on a length of nonabsorbable polypropylene suture material (Figure 1). The proximal end of the thread is provided with a preformed knot which at insertion is placed in the fundal myometrium with an inserter for anchoring the device (Figure 1). 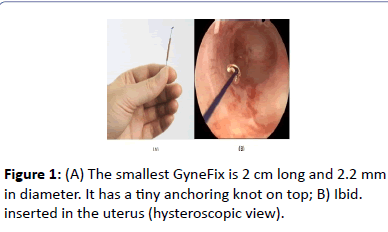 Figure 1:(A) The smallest GyneFix is 2 cm long and 2.2 mm in diameter. It has a tiny anchoring knot on top; B) Ibid. inserted in the uterus (hysteroscopic view). Immediately below the anchoring knot is a small stainless steel tube (2 mm long and 0.5 mm in diameter) which is fixed onto the suture thread. This metal element (marker) allows clear visualization on ultrasound examination to assure proper placement (Figure 2). Unlike conventional copper IUDs which use a wire on the stem of the IUD, the use of copper cylinders allows for copper release from all surfaces, inner and outer. With this concept, the size of the foreign body, which is directly related to tolerance and effect on menstrual blood loss, can be minimized . GyneFix 200 has an effective copper surface area of 250 mm2 which is not significantly different from most, much larger, copper IUDs as the copper lying against the plastic is not releasing copper ions. With the latter IUDs, the effective surface area is significantly lower than the nominal surface area . The GyneFix IUD with 4 copper tubes is the smallest IUD that exists and is suitable for normal and very small uterine cavities of adolescent and nulliparous women. Once properly affixed the device has been shown to be retained for over 5 years with minimal secondary expulsion. This innovative device has no plastic body, eliminating the impact of uterine forces attempting to expel it especially during menstruation (Figure 2). Figure 2:2D ultrasound inserted immediately post-abortion. The “marker” is clearly visible in the uterine fundus (arrow) and provides assurance about the correct insertion of the IUD. Its distance from the serosa (6.92 in this case) confirms its proper and safe position in the fundus of the uterus. It is advisable to look for the marker following insertion of the frameless IUD. Conventional insertion in a normal clinical setting in many ways mimics the procedure used for framed devices and is simple once physicians are properly trained and familiar with the procedure. Following evacuation and contraction of the uterus, a 2D ultrasound is performed to assess completeness of the procedure and to measure the thickness of the uterine fundus. The uterine sound (available in the package) is then inserted to measure the depth and to ascertain if contact can be made with the uppermost fundal wall. The applicator is then inserted in the uterine cavity against the fundus. The anchor is then pushed forward, using constant but gentle force, into the myometrium until the safety stop is reached. Care is advisable to insure placement in the midline where fundal thickness is greatest. After insertion the inserter is removed, after which the thread is cut to a desired length. Once properly affixed the device clinical studies have shown it can be maintained for 5 years or longer, depending on the type of device used. If concerns arise concerning proper placement 2D ultrasound allows for re-evaluation. Removal is simple and of minimal discomfort allowing for insertion of a new device either immediately or at secondary visit. Return to fertility is almost immediate upon device removal. Post-abortion insertion of an IUD holds an additional advantage over conventional insertion in that the uterine fundus is easily accessible and visible, facilitating insertion and placement. For doctors familiar with performing abortions, basic technical dexterity is apparent or can be easily acquired. A video of the insertion procedure can be viewed on the author’s website (dirk). Insertion of the frameless IUD postmedical abortion is identical. Prior to insertion completeness of abortion should be assessed as well as the thickness of the fundus. Several multicenter and single center clinical trials, totaling 483 insertions, were performed with post-abortion insertion of GyneFix. The results are shown in Table 2. No expulsions of the anchored IUD occurred in the first three first studies when physicians were properly trained. In contrast, 5 expulsions were reported in the Canadian study. Continuation rates at one year, up to 5 years, reported in two studies was over 90% (Table 2). Table 2: List is studies conducted with the frameless IUD inserted following surgical abortion. One of the main reasons for the development of the anchoring concept is to prevent expulsion of the IUD. Full expulsion of an IUD inserted post abortion occurs most often during the first months after insertion and is mainly due to spatial discrepancy with a too large uterine cavity. Total expulsion of a conventional T-framed IUDs occurs in 5%–15% of women during the first year of use. It is however likely that many of the IUDs that are not expelled will embed during involution of the uterus . When the uterine cavity shrinks, the IUD may become compressed and pushed downward towards the cervix due to forceful uterine contractions . Displacement, malposition and embedment of an IUD is not uncommon and often results in early removal because of side effects, mostly cramping pain and abnormal bleeding. A Chinese study found that women with a transverse diameter of the uterine cavity in the fundus that is greater than the width of the IUD had a higher risk of expulsion or displacement. This was the case for users of the TCu380A IUD, which has a span of 32 mm, with transverse width of the cavity >37 mm . Displacement and expulsion of the IUD have an impact on the continued use of the method. However, in the context of reducing the number of repeat abortions, a low IUD expulsion rate has a great merit but high continuation of use is paramount. Continuation of use is the most important determinant of performance of any contraceptive method. Continuation rates with conventional IUD inserted after immediate surgical abortion at one year between ~50% and ~80% were reported in the literature . Frameless IUDs may have several distinct advantages over conventional IUDs due to their unidimensional design and anchoring to the uterine fundus. The low expulsion rates and high continuation rates in the studies presented in this paper with the frameless IUD may be due to the optimal relationship between the device and the narrow cavity of many women . Typically, expulsion of the frameless device are is when inserted properly; if and when they do occur they typically occur early on and are related to poor insertion technique and/or failure to confirm questionable placement. Spontaneous expulsion after confirmation of proper placement at follow-up occurs in less than 1%. As a consequence high continuation rates of over 90% were recorded similarly to the high continuation rates reported during interval insertion at 3 years. Continuation rates remain high during subsequent years as women do not or rarely develop secondary side effects . The device’s small size, absence of transverse cross arms, it’s flexible nature and its ability to be inserted in women, irrespective of uterine cavity size, allows it to easily accommodate uterine forces attempting to expel it even post-abortion or even during menstruation. Studies also suggested that adolescent and nulliparous women tolerate the small GyneFix 200 IUD . The anchoring technique is currently being used by many practitioners postabortion; however, its use on a larger global scale is awaited. The frameless GyneFix IUD belongs to the category of precision medical devices for suspension in the uterus. It is advised to measure the thickness of the uterine fundus prior to implanting the anchoring knot to confirm overall suitability of the uterine cavity and identify fundal maximal fundal thickness. Figure 3 shows an example of a measurement. In the event the boundary with the endometrium is difficult to identify, measuring the fundal thickness in the premenstrual phase or after instillation of gel (gel instillation sonography, GIS) will aid in visualization knowing the thickness of the fundus provides assurance; feeling the anchor penetrating the muscle wall provides confidence and measuring the SAdistance (Figure 2) confirms proper positioning in the fundus of the uterus (Figure 3). Figure 3:Example of a 2D sagittal ultrasound, measuring the thickness of the fundal wall which should be at least 10 mm. IUD insertion immediately post-abortion has been shown to significantly reduce the frequency of abortions and repeat abortions worldwide while also providing women with safe and effective long term contraception. IUD insertion postabortion should, therefore, be vigorously advocated. Decisions as to what type of device to insert needs to be made between the patient and physician; however, a patient’s long term comfort needs is a pivotal aspect to be assessed in order to assure maximal duration of use. Besides, immediate post abortion IUD insertion has been shown to be cost-effective . This may help in convincing politicians and insurance companies to reimburse the method. LARC methods, whether IUD or implants should become an integral part of abortion and post-abortion care, in line with the recommendations of the International Federation of Gynecology and Obstetrics and of several other organizations . Dirk Wildemeersch, MD, PhD, has been involved in the optimization of new, innovative; drug delivery systems for use in the uterus. He is currently advisor in devising new concepts in controlled release for contraception, gynecological treatment, and prevention of infectious diseases. Sedgh G, Bearak J, Singh S, Bankole A, Popinchalk A, et al (2016) Abortion incidence between 1990 and 2014: global, regional, and subregional levels and trends. Lancet 16: 30380-30384. Trussell J (2011) Contraceptive failure in the United States. Contraception 83: 397-404. Committee on Gynecologic Practice Long-Acting Reversible Contraception Working Group (2015) Committee Opinion No. 642: Increasing Access to Contraceptive Implants and Intrauterine Devices to Reduce Unintended Pregnancy. ObstetGynecol 126: e44-48. Heikinheimo O, Gissler M, Suhonen S (2008) Age, parity, history of abortion and contraceptive choices affect the risk of repeat abortion. Contraception 78: 149-154. Goodman S, Hendlish SK, Reeves MF, Foster-Rosales A (2008) Impact of immediate postabortal insertion of intrauterine contraception on repeat abortion. Contraception 78: 143-148. Lähteenmäki P, Luukkainen T (1978) Return of ovarian function after abortion. ClinEndocrinol (Oxf) 8: 123-132. Grimes DA, Lopes LM, Schulz KF, Stanwood NL (2010) Immediate postabortal insertion of intrauterine devices. Cochrane Database Syst Rev. Shimoni N, Davis A, Ramos ME, Rosario L, Westhoff C (2011) Timing of copper intrauterine device insertion after medical abortion: a randomized controlled trial. ObstetGynecol 118: 623–628. Wildemeersch D, Rowe PJ (2004) Assessment of menstrual blood loss in Belgian users of the frameless copper-releasing IUD with copper surface are of 200 mm2 and users of a copper-levonorgestrel-releasing intrauterine system. Contraception. 70: 169–172. Wildemeersch D (2006) The effective copper surface area differs substantially between that of the frameless copper IUD and that of conventional copper IUDs: a comment. J FamPlannReprod Health Care 32: 54. Wildemeersch D, Goldstuck N (2015) Expulsion and continuation rates after postabortion insertion of framed IUDs versus frameless IUDs – review of the literature. J Contraception 6: 87–94. Goldstuck ND, Wildemeersch D (2014) Role of uterine forces in intrauterine device embedment, perforation, and expulsion. Int J Womens Health 6: 735-744. Liang H, Li L, Yuan W, Zou Y, Gao ES, et al. (2014) Dimensions of the endometrial cavity and intrauterine device expulsion or removal for displacement: a nested case-control study. BJOG 121: 997-1004. Wildemeersch D, Pett A, Jandi S, Hasskamp T, Rowe P, et al (2013) Precision intrauterine contraception may significantly increase continuation of use: a review of long-term clinical experience with frameless copper-releasing intrauterine contraception devices. Int J Women’s Health 5: 215–225. Cao X, Zhang W, Zhao X, Wildemeersch D (2006) Three-year efficacy and acceptability of the GyneFix 200 intrauterine device. Contraception 73: 315–317. Wildemeersch D, Jandi S, Pett A, Nolte K, Hasskamp T, et al. (2014) Use of frameless intrauterine devices and systems in young nulliparous and adolescent women: results of a multicenter study. Int J Womens Health 6: 727–734. Salcedo J, Sorensen A, Rodriguez MI (2013) Cost analysis of immediate postabortal IUD insertion compared to planned IUD insertion at the time of abortion follow up. Contraception 87: 404-408. Gemzell-Danielsson K, Kopp Kallner H, Faúndes A (2014) Contraception following abortion and the treatment of incomplete abortion. Int J GynaecolObstet 126 Suppl 1: S52-55.